Take off on a fantastic video trip. A voyage that simulates the thrills and skills of actual Hang Gliding. Players use the joystick to control Freddie, but good timing and strategy is necessary to successfully negotiate invisible air currents, wind direction and up and down drafts. 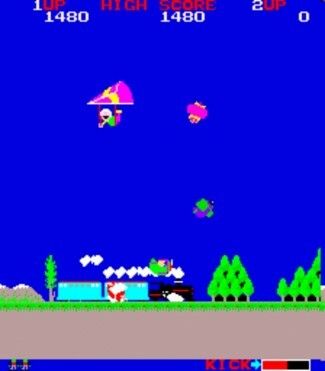 This game has incredible visual impact for this time, Freddie flies the skies over the Alps–over trains, trees, bridges, through winter and summer seasons; over the Pacific–over a yacht, tropical islands, an aircraft carrier; and over Egypt–camels, Pyramids, the Taj Mahal, the Sphinx, through day and night landscapes. It’s a complete global challenge with non-stop action over a continuously changing panorama below.